Ages 5 through 11. 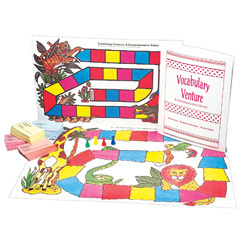 The thinking games in this kit build language skills as children make comparisons, describe word relationships, give explanations, identify errors in word usage, and perform various other language tasks. Children are challenged to think as they respond to the questions on the game cards. The kit includes the activity manual, game cards, two full-color game boards, game pieces, and a durable storage box. The game is perfect for students with language disorders and other language-based learning difficulties. The skillx emphasized help children meet instructional objectives related to core curriculum standards. Skills targeted are emphasized within the classroom language arts curriculum.